Cold laser therapy, also known as ‘Low-level’ laser or photon therapy, operates by using measured, specific wavelengths of light to penetrate the hair, skin, and tissues of the body to stimulate the mitochondria of the cells. Body cells contain receptors that respond to these wavelengths of light. These responses trigger a “cascade of healing” that begins in the mitochondria and spreads through the cell increasing the ability of the cells to repair the tissues. 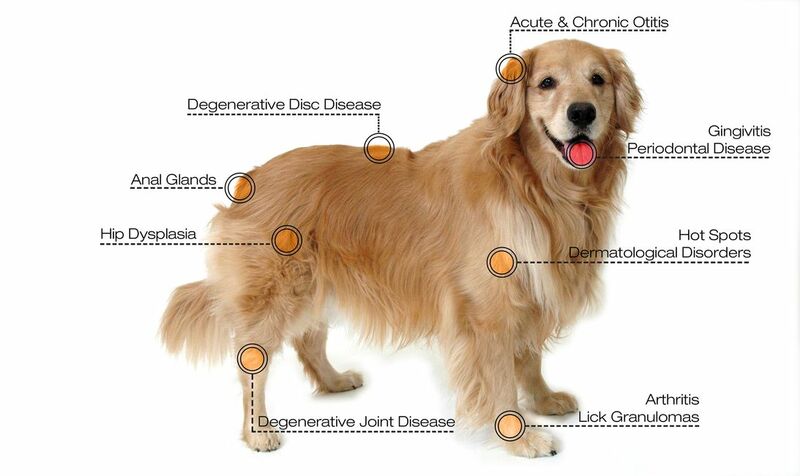 Use of cold laser therapy encourages healing without causing damage, requires very little time to perform, and is generally relaxing and enjoyable for pets. Infrared light also operates through using a specific wavelength of light to trigger a reaction on the cellular level. This reaction signals the body to increase production of Nitric Oxide, which increases blood flow. This type of increase in Nitric Oxide assists the performance of muscles in the short term, as well as reducing wear and tear in the long term.